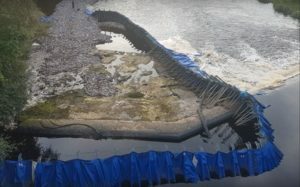 Many weirs and other flow control devices which have prevented passage up river for the fish and eels are being either removed or adapted. 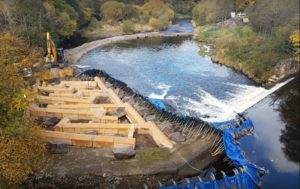 Weirs are designed to raise the water levels which often creates fast and high volume flows over and around the structures, which in turn creates a difficult and dangerous environment in which to carry out work. Weirs are responsible for numerous deaths each year, often arising from a lack of appreciation and understanding by even the most experienced of river users who can succumb to the turbulence and back flows generated. Portadam is often specified as the system to be used on weir projects and has also been called upon, part way through projects, when unsuitable damming systems have failed. Failure of unsuitable systems could have potentially fatal consequences or at best just delay and prolong projects,. Portadam is specifically designed to operate in dynamic water courses and to withstand the turbulent and fast flowing conditions associated with weirs, whether located on flashy rivers in steep sided catchments, or the more serene flows of the lower lying channels. 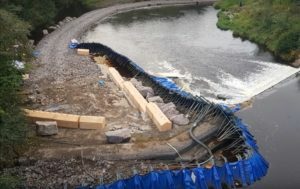 Understanding the nature of flows on weirs is key to providing a safe and effective work area to facilitate the weir removal or adaption with the key word being ‘safe’. OnSite has vast experience in managing these flows and has installed dams across a wide range of weirs in different environments.